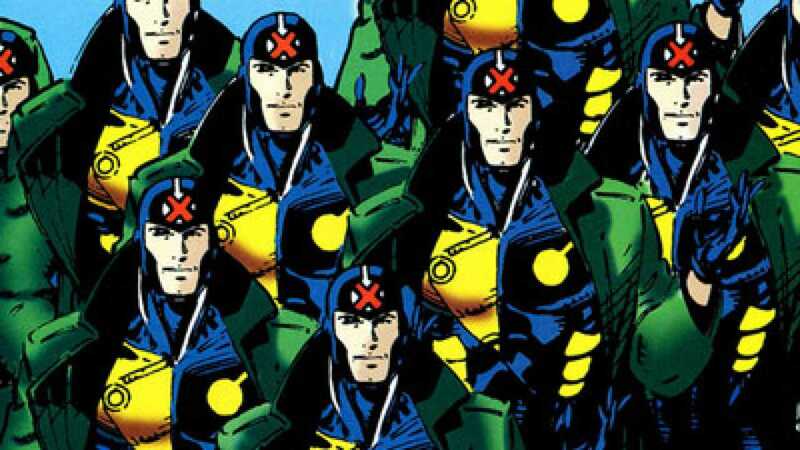 X-Men – Teach Like a Superhero! Are you the one smiling and standing on top? Crossed-armed and alone out on a limb? Are you helping someone climb on? Watching someone fall? This simple image can lead to a fruitful discussion of personal success, challenges, and concerns. It also helps to stop and reflect from time to time, since our place and activity in this image can change. What caused the change? Circumstances? Attitude? Actions? Try this activity with your colleagues or class the next time you have a few spare moments. It’s a good start or end to a session. Take the opportunity to intentionally self-evaluate. Are you the triumphant, classic costumed Wolverine on top? The squished one in the middle? The samurai-inspired noble warrior at bottom right? The Wolvie losing his hat? The one with the claws? Like superheroics, teaching is a serious business requiring grit, bravery, and “a fighting spirit.” But it’s also essential to find moments of humor and fun. Op, op, op, op oppa Gangnam Style . . . Most importantly, teachers (and students) should take time to pause and consider their personal attitudes and positions. Are we behaving and thinking appropriately for the given situation? How can we help those around us? You forgot your homework again?!!? This blog post is unique because I’m writing it from San Diego, where I’m attending a convention. No, not THAT convention – San Diego Comic-Con International – although the Convention Center is just across the street. Like I said, I’m not lucky enough to be in town the same time as Comic-Con. But I am lucky enough to be at a convention with hundreds of other educators. This particular “con” is focused on accreditation of teacher preparation programs. The topic may sound dryer than San Diego heat, but it’s not too bad. Most sessions are led by educators, who know a thing or two about engaging a crowd of semi-disinterested individuals. 1. A convention center without fans, celebrities, and cosplayers is like a school building without students, teachers, and staff. A brilliant building with fancy facilities is a wonderful thing to behold; but it only makes a difference when it hosts a crowd of excitable and exciting characters. 2. What convention are you attending next? I’m not talking about a district-required in-service necessary for churning out continuing education credits. Seek out a teacher-focused conference or convention that expands your network of colleagues, refines your thinking, and builds on your repertoire of strategies. Better yet, sign up to SHARE a session or workshop with your professional peers. 3. Someday I hope to visit San Diego again and attend Comic-Con. Until then, here are some conferences I’ve attended (or will attend) recently. Check one out, if you’re interested. Or find something else that more closely matches your field of expertise. You don’t have to attend a “con” somewhere far away or expensive. Most of those I go to are within driving distance, and many times you can pay a discounted fee to attend only part of the convention. In most cases you get what you pay for, though, and it’s healthy to expand your horizons beyond your home district or state. Find a super group of teachers to encourage and educate you – and you can do the same for them. They’re waiting for you! The latest superhero flick is Deadpool, which is making news for its “hard” R-rating for humor and violence. If you don’t know much about Marvel’s “Merc with a Mouth,” here is a fun tutorial courtesy of artist Ty Templeton. The movie itself is doing great commercially and critically, even getting approval from Betty White herself. What is the sound of your voice? We’ve talked before about the importance of what teachers say in the classroom (namely questions). But it’s also important to consider how you say it. What’s your tone of voice when you talk in class? How loud? How fast? How much variety? In comic books, characters speak in “word balloons” (or “speech bubbles”), and it’s fascinating to notice the unique techniques creators use to convey dialogue on the page. Just like people, comic book heroes have unique voices, and letterers (the folks who draw word balloons) often use specific styles for particular characters. For instance, Deadpool always speaks (and thinks) in yellow word balloons. No one is sure what it’s supposed to sound like, aside from a mix of sarcasm and crazy. Take a moment and consider what your words would look like if someone drew balloons around them. Eric Wong at the Sequart Organization wrote a nifty article about the different ways comic books communicate sound. As you examine these examples, think about the sounds in your classroom. What is helpful? What is hurtful or distracting? Teachers should record their classroom instruction and interactions from time to time. You don’t have to sit down and watch an entire lesson. Just listen to a few minutes and notice what your students actually hear. 3. If you have a snarky streak, save it for open mic night at the comedy club. Students respect teachers who show them respect first. So whatever kind of “word balloons” you use in the classroom, make sure they fit the space and focus on learning. 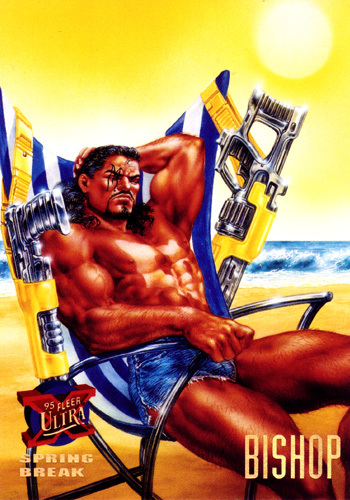 It’s that time again when T4SH takes a short break during the summer months. A break from lengthy blog posts, at least. Look for resources, updates, and links via Facebook while you’re chilling out poolside, beachside, or inside. Time-traveling X-Man Bishop proves that blue jean cutoffs NEVER go out of style. Just beware that nasty tan line. Teachers for Hire – Research and statistics on teachers’ time and money. Question(s) and Answer – Resources and strategies for asking good questions in the classroom. Flex Plan – Movie studios plan superhero movies YEARS in advance. How far into the future should teachers plan lessons? Fantastic Teaching – Timeless traits of effective teachers, inspired by Marvel’s First Family. Take time this summer to work on your beach bod AND your classroom prowess. Warning: Today’s topic contains both intense geekery and buzzword-bashing. Proceed cautiously. Blockbuster movies are not the only highlight of summer. It’s also the season when comic book publishers launch company-wide crossovers that promise to shake up a universe or two (or 52). Marvel Comics and DC Comics have both blasted readers with major events this year. 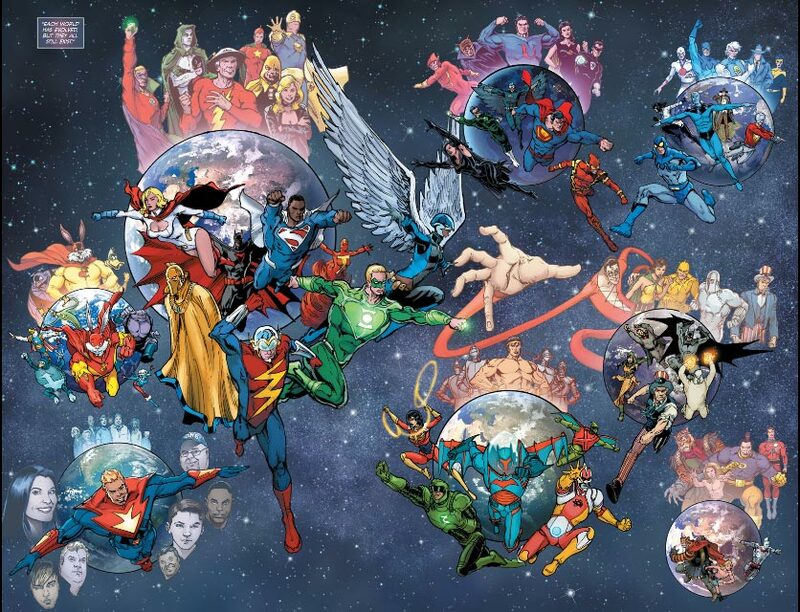 DC recently ran through a “Convergence” that ended with every version of its universe (pre-Crisis, pre-Zero Hour, pre-Flashpoint, etc.) returning to existence. That means every crazy version of familiar heroes and villains can appear in some form or another in one of several alternate universes, or multiverses. Confused? Check the hyperlinks above to read more about DC’s habit of rewriting history in their comic books (“reboots”). And you can read more here and here, then impress your friends with a mindful of multiversity. Reboots are Made for Walking . 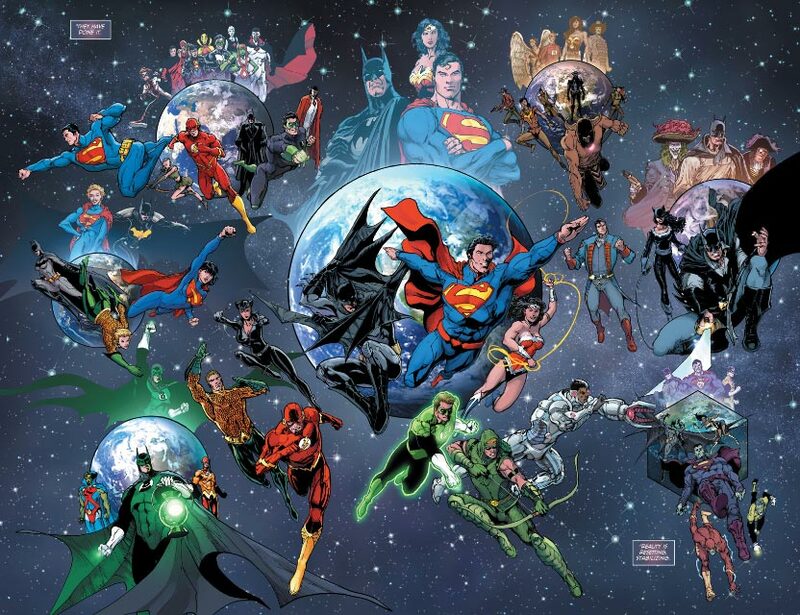 . .
DC rebooting its universe(s) is nothing new. But Marvel Comics has always prided itself on maintaining a single continuity in its main universe (called “Earth-616,” and don’t ask why). 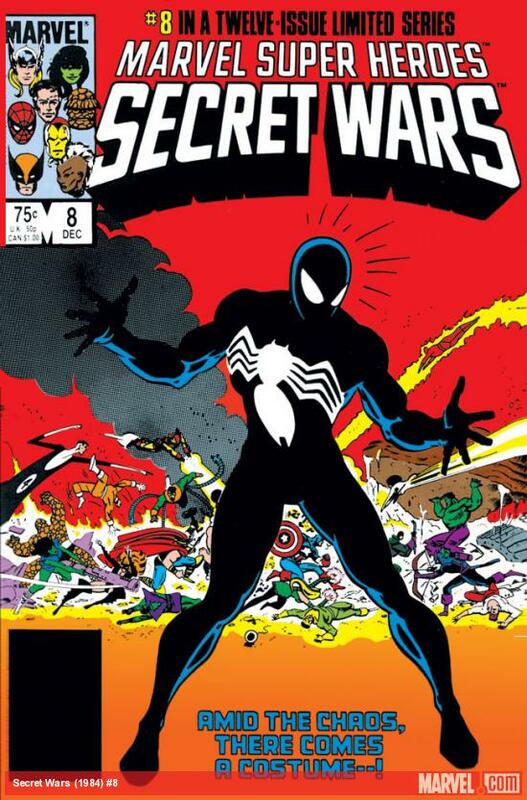 That’s all changed this summer, though, with Marvel’s tentpole production “Secret Wars.” If that name sounds familiar, the original “Secret Wars” (1984) was Marvel’s first mega-crossover teaming up all of its major heroes – Spider-Man, the Avengers, Fantastic Four, the X-Men, and more. Plus, it’s where Spidey got himself his snazzy black costume that . . . didn’t end well. 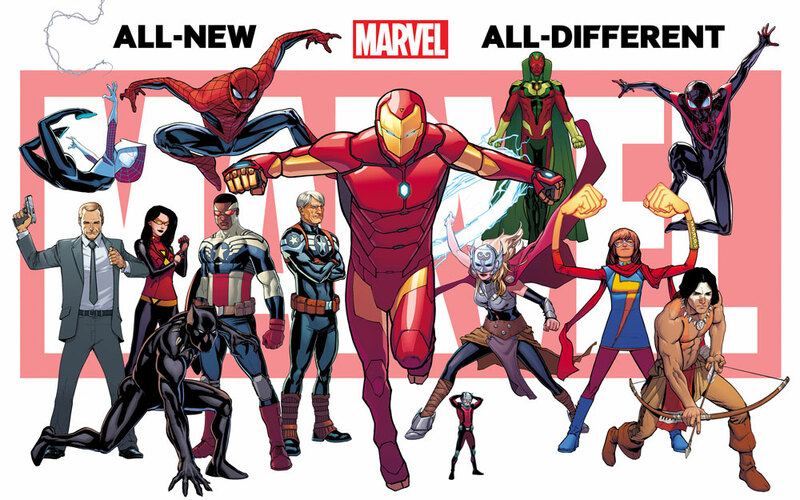 In Marvel’s current 21st century crossover, every alternate universe (technically not the same as a multiverse; trust me) is starting to shmoosh into each other, with Earth as the epicenter. 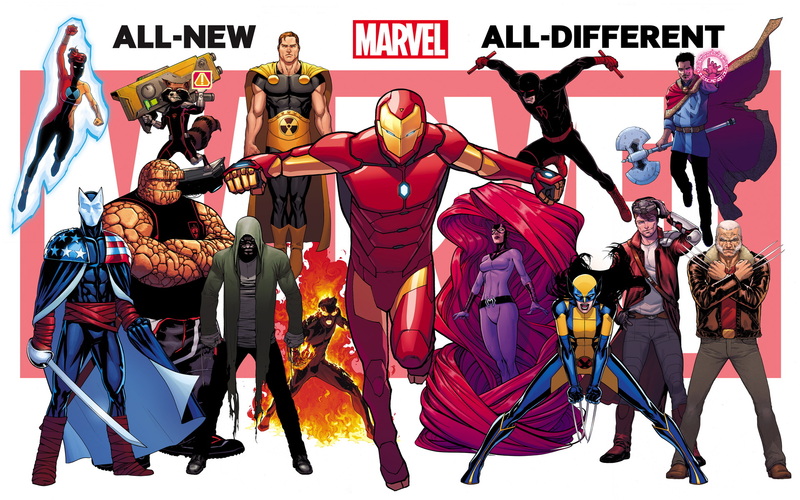 What results is a hodgepodge of alternative Marvel Earths mish-mashed all on one planet. 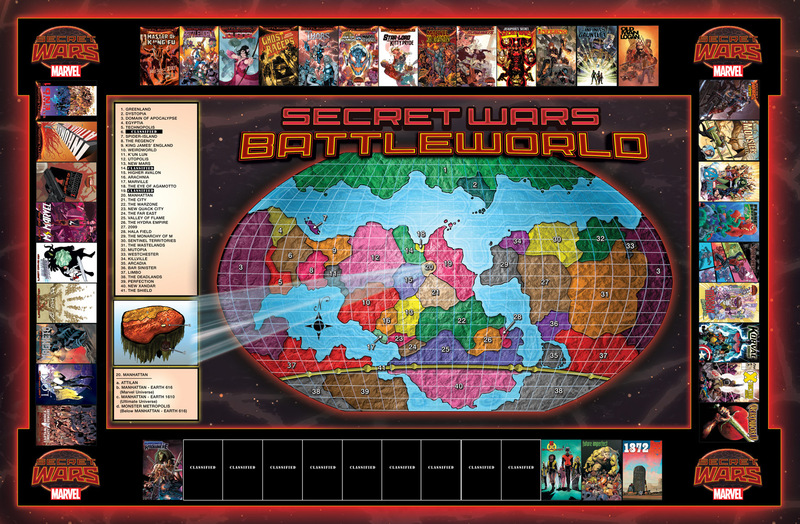 This subsequent world is called “Battleworld,” where apparently assorted Marvel heroes and variations duke it out over land rights. Who knows how long either of these nascent realities will last? In recent history, world-shattering moments seem to happen every other issue. But, hey, it’s comic books. I count two Spider-Men, two Spider-Women (one is “Spider-Gwen”), and two Captain Americas (one is old Steve Rogers, the other the old Falcon). Look back at the first Marvel promo and find two Wolverines (one female, the other old Logan). Duplicating heroes is one way to increase diversity. But it can sometimes dilute the specialness of super-heroes. I’m not just talking about spreading thin unique super-powers, but also decreasing high-stakes adventures. If a certain hero is facing life-and-death odds, it’s no big deal, since a copycat can fill any vacancy. And if your world blows up, just hop over to the next universe. Let’s talk about teaching and blow up some more multiplicity problems. “Multiple Intelligences,” to be precise. 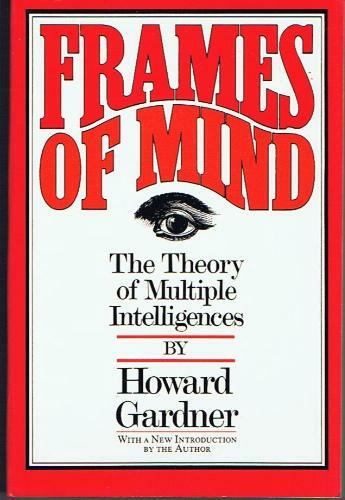 Back in 1983 (one year before Marvel’s first “Secret Wars”), Harvard professor Howard Gardner argued that a general intelligence (“IQ”) measure is insufficient, and proposed seven different “intelligences” one could possess. Most people have strengths and weaknesses around this pie, and are more comfortable in some categories (or combos) than in others. Of course everyone has different strengths. They’re called talents. Skills. Natural abilities. Preferences. Interests. Comfort zones. Many educators – many with the best of intentions – latch onto “multiple intelligences” thinking they have to cater to everyone’s needs. Taken to the extreme, each topic to be learned requires eight different lessons or activities. That way you cover all the bases. Another term that overlaps with multiple intelligences is “learning styles.” Educators frequently pigeonhole different students according to a specific strength or preference – visual, auditory, kinesthetic. Worse, students may self-label or assume the identity they’ve been assigned, with the notion that they are stuck in one role with no opportunity to grow or change. To his credit, Howard Gardner has explained how his ideas of multiple intelligences are NOT the same as learning styles. This is helpful, as comprehensive learning relies on much more than just “style.” Moreover, research has found little evidence that matching teaching to a specific learning preference produces higher understanding. Unfortunately, such clarification is lost among the bulk of educational professionals and publications. 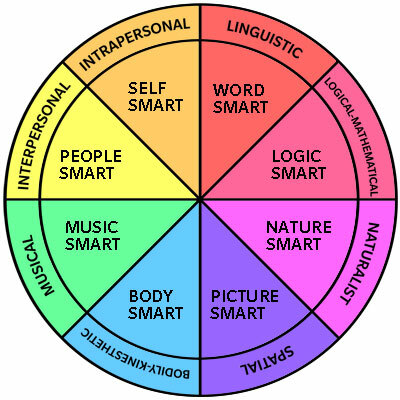 Here’s another problem: Some of these “intelligences” are more practical in everyday life than others. No matter how much you plead, no one will sing the ballot to you the next election day. You have to read to vote. The next time you get pulled over for texting while driving, try explaining to the officer that you have interpersonal intelligence. See how far that gets you. I’m not saying we should dismiss any student who doesn’t excel at a particular subject or skill. Celebrate their strengths. Find ways for them to use and share that talent. But don’t compromise content learning. And help people shore up their weaknesses. 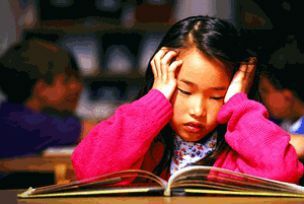 A nasal learner struggles with an odorless textbook. From The Chronicle: “Teachers should worry about matching their instruction to the content they are teaching. Some concepts are best taught through hands-on work, some are best taught through lectures, and some are best taught through group discussions” (Glenn, 2009). From the NSTA: “Using appropriate representations that carefully consider how to best convey the content is important. In addition, we need to scaffold between concrete and more abstract representations, being sensitive to the abilities of our students to handle abstractions. Finally, when students struggle to understand, we need to look at both the nature of the content as well as the prior experiences of our students” (Olson, 2006). This is a good start to wise planning and teaching. Click on the hyperlinked articles above for more in-depth reading and reflection. 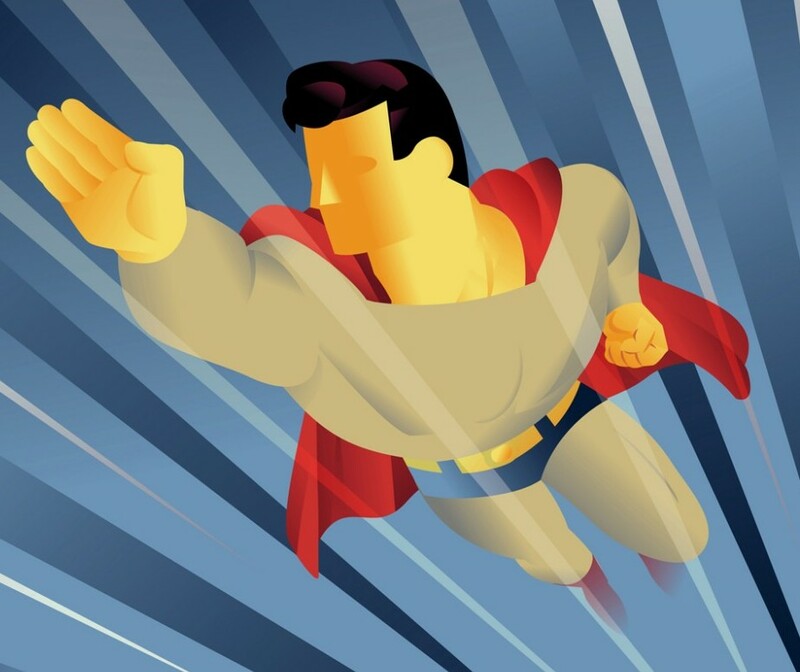 Multiple intelligences – like multiple superheroes – can have some merit in the right context. But both can explode out of control and become gimmicky. Be wary of too much reliance and redundancy, resulting in loss of impact. It’s been a while since our last blog post and we have all kinds of critically important issues to talk about, starting with . . . OH YEAH! 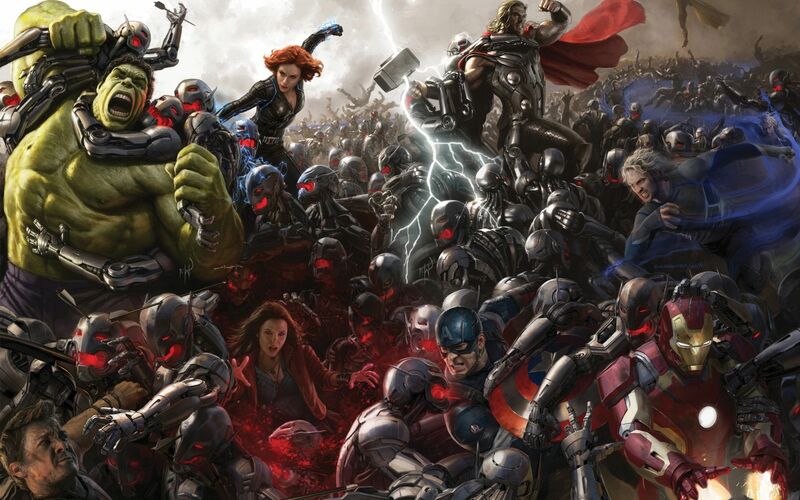 AVENGERS: AGE OF ULTRON super-duper blockbuster opens THIS WEEKEND! The latest greatest superhero movie can provide a useful springboard for exploring the dangers of relying too much on technology (e.g. resulting in an evil sentient robot that tries to kill all humankind). Forget a vengeful Ultron or iPad; beware of students plugged in but tuned out to meaningful learning. 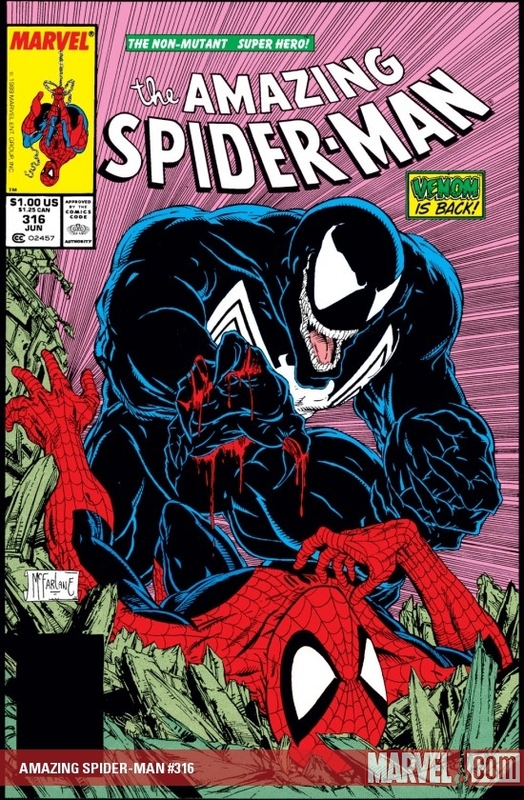 We’ll table that discussion for another time, however, given recent chatter about another famous Marvel character who may possibly join Earth’s Mightiest Heroes on the big screen: Spider-Man. Thanks to Photoshop, we already have a poster! 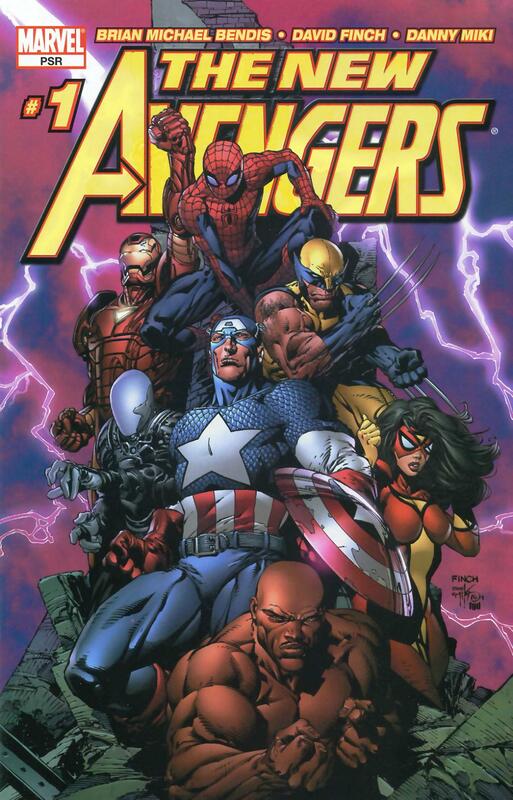 Like Captain America and company, Spider-Man is a mainstay Marvel Comics character. But up until now, everyone’s favorite web-slinger has appeared in his separate series of movies due to film rights owned by Sony Pictures. Confused? Don’t worry, because bigwig producers have signed important papers and the stars have aligned and now Spidey can swing along with the Avengers in the official “Marvel Cinematic Universe,” or MCU. Fan reaction has been understandably joyous, given the potential team-up between Marvel’s flagship hero and Marvel’s flagship hero team. Heck, the good folks at IGN have already imagined what Age of Ultron would look like with Spider-Man in the mix. Take a look at their trailer here, if you’re curious. Enthusiasm has erupted for integrating even more heroes in the movies. Speculation abounds if Marvel’s other movie heroes – the X-Men, the Fantastic Four – could ever merge into the MCU. Even Wolverine’s Hugh Jackman wants to join in the mix. Coming to a movie theater near you? Such integration of superheroes (a.k.a. worlds colliding) may appear as a bounty of riches; but there could be a downside. 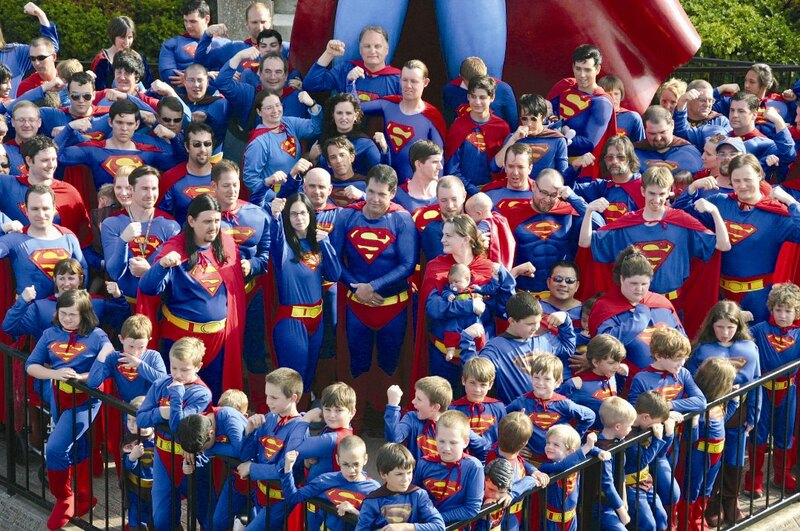 A common feature of disappointing superhero movies is a glut of characters in the script. Spider-Man 3 had Sandman and Venom and the Green Goblins clogging the villain faucet. Batman & Robin was actually Batman and Robin and Batgirl and Poison Ivy and Bane and Mr. Freeze. 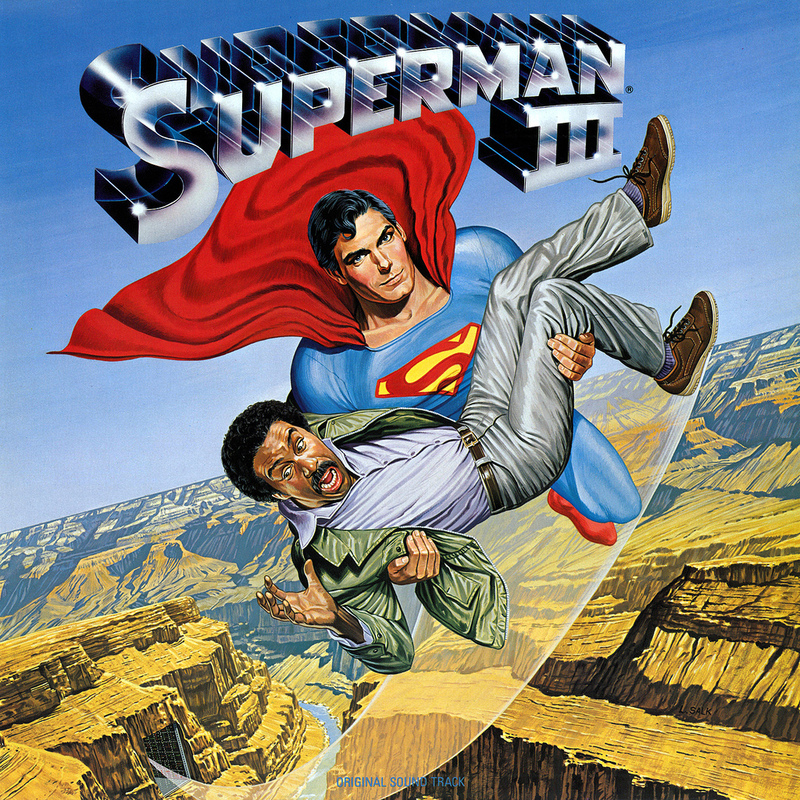 Superman III had Richard Pryor. Curriculum Integration in schools is another appealing mash-up that may have a hidden downside or two. Basically, integrating curriculum is what teachers do when they teach lessons combining two or more major subjects or disciplines. Examples are as obvious as teaching algebra and graphing with a science experiment, and as unique as an instructor’s imagination. I know of a middle school that features a building-wide interdisciplinary unit all about the Greek Olympics. Every class studies some aspect of the ancient athletes – math, history, language arts, visual arts, science, P.E., and more. Sounds neat, right? And perhaps a little daunting to pull off, given the coordination of teachers, resources, and activities. But that’s just a challenge, not the downside. The upside is collaborative educators and students energized by explicit and relevant connections among various scholarly endeavors (subjects). 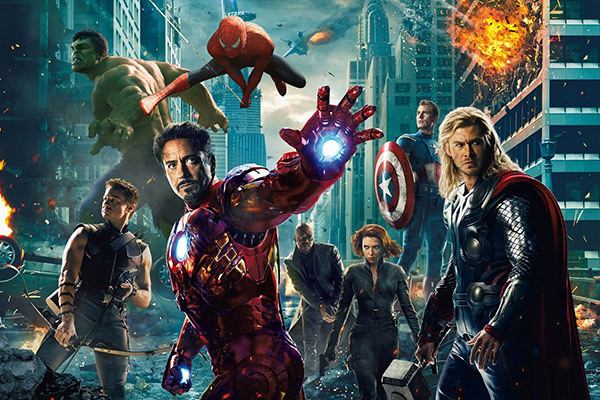 The danger of curriculum integration in classrooms is similar to those in superhero movies. Cramming in too much can end up in confusion and misconceptions. Content may be watered down, spread thin, or lost in the shuffle. Take a minute to look at this article, “A Caveat: Curriculum Integration Isn’t Always a Good Idea,” by Jere Brophy and Janet Alleman for a more robust examination of this strategy. Better yet, print it out and read it while you wait in line for your Avengers movie tickets. Or download it on your portable digital device. Technology can be great. So can curriculum integration. Just be careful.